Lieutenant General Tukur Yusuf Buratai is the current and 26th Chief of Army Staff of Nigeria, appointed to the position by President Muhammadu Buhari on July 13, 2015. He was commissioned in 1983 and has had multiple command, administrative, and instructional appointments. General Buratai is from Buratai town, Biu Local Government Area of Borno State. His father, Yusuf Buratai, was a non commissioned officer in the Royal West African Frontier Force and World War II veteran who fought in Burma. General Buratai had his primary education at Buratai town and thereafter gained admission to Government Teachers College Potiskum, Yobe State, where he graduated with distinction. In January 1981, Buratai attended the Nigerian Defence Academy Kaduna as a member of the 29 Regular Combatant Course (29 RC). On successful completion of his Officer Cadet training, he was commissioned as a Second Lieutenant on 17th December 1983 into the Infantry Corps of the Nigerian Army. Buratai has a degree in History from University of Maiduguri and a degree in Philosophy from Bangladesh University of Professionals, Dhaka. He served in 26 Amphibious Battalion Elele, Port Harcourt, Military Observer at the United Nations Verification Mission II in Angola; later 26 Guards Battalion, Lagos; Lagos Garrison Command Camp. Lt Gen Buratai also served as administrative officer at the State House, Abuja; 82 Motorized Battalion; 81 Battalion, Bakassi Peninsular; Army Headquarters Garrison, Abuja before he became a Directing Staff at the Armed Forces Command and Staff College, Jaji, earning the prestigious “Pass Staff College Dagger” (psc(+)) appellation. Subsequently, he served at AHQ Dept of Army Policy and Plans, Abuja; Assistant Chief of Staff Administrative Matters, HQ Infantry Centre Jaji. Additionally, he was again at the Armed Forces Command and Staff College as Director Dept of Land Warfare from where he was appointed Commander 2 Brigade, Port Harcourt, doubling as Commander, Sector 2 JTF Operation PULO SHIELD. 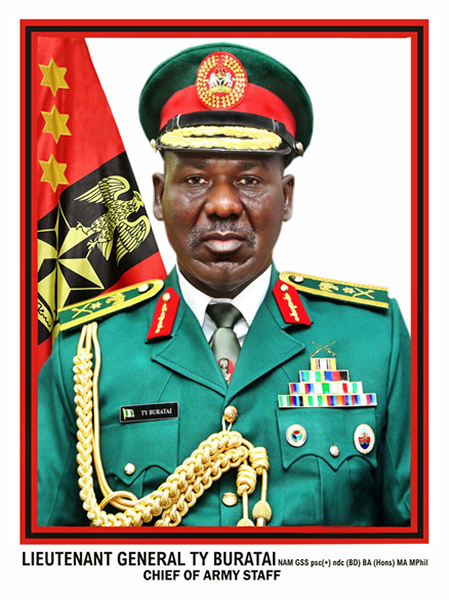 Upon promotion to the rank of Major General, he was appointed Commandant, Nigerian Army School of Infantry, Jaji; thereafter he was appointed Director of Procurement DHQ before being appointed Force Commander of the newly reconstituted Multinational Joint Task Force (MJTNF) under the auspices of the Lake Chad Basin Commission and Benin Republic, an appointment he held till he became Chief of Army Staff. His operational deployments include Military Observer at the United Nations Verification Mission II in Angola, Op HARMONY IV in the Bakassi Peninsular, OP MESA, Op PULO SHIELD, Op SAFE CONDUCT, MNJTF, Op ZAMAN LAFIYA and Op LAFIYA DOLE. He was appointed Chief of Army Staff on July 13, 2015. Lt Gen TY Buratai, 9 September 2015.